Smallest House in Britain– the itty bitty red one on the side! Tucked on the end of a row of houses near the walls of Conwy Castle is Britain’s smallest house. 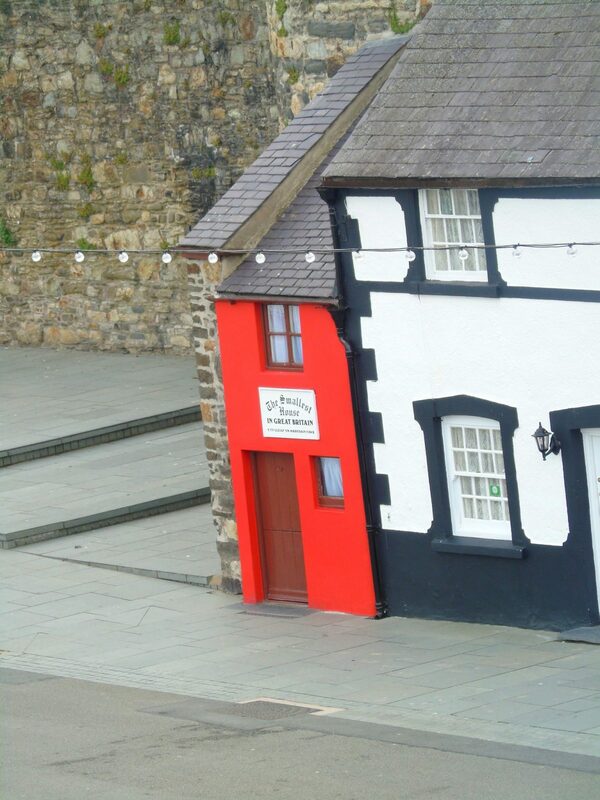 The Quay House, with a footprint measuring a mere 10’ by 5.9’ and a total height of 10’2” to the eves, pained fire-engine red, is located in Conwy, Wales. The house got its name because it is located on the quay, a wharf or reinforced bank for the loading or unloading or ships or boats. The Quay House was a residence from the 16th century until 1900. The last resident was a fisherman by the name of Robert Jones, he was 6’3”. The Quay House, which is still owned by descendants of Robert Jones, hosts thousands of visitors a year. Visitors to the house are amazed and awed that a house, which is so small, is still so practical and efficient. The Quay House is open from 10am to 4pm during most days. Late visitors and school trips please contact The Quay House here . The cost of admission is 50p for children and £1 for adults. The Aberconwy House is a 14th century merchant’s house from medieval times, which has survived six centuries of a turbulent history. Upon visiting the house, you can learn about the daily life through the centuries by an audio-visual presentation. Conwy Castle, built during King Edward I’s second campaign in North Wales between 1283 and 1289, sits on the location of Deganwy Castle. The former stronghold of King Henry III that was destroyed by Llywelyn the Last in 1263. It is a little known fact, Conwy was once an important pearl fishery and harvested as much as 4 kilograms of pearls per week in the 169th century. Musseling the old-fashioned way is still active in Conwy today, but now practiced on a much smaller scale. The Conwy Mussel Museum provides the history behind the Conwy mussels, their uses, and the mysteries involving a royal crown. This looks like so much fun! I love that they embraced it and painted it bright red! 🙂 Do they not allow photos inside? I am so glad that you liked to reading about Britain’s smallest house!They do allow pictures to be taken but at the time that we were there it was closed. I would have loved to go inside!